As the world prepares to go gaga over another royal wedding – Meghan Markle and Prince Harry – it was an excuse to visit Windsor Castle the marriage venue. It was an easy daytrip by train from London to the ancient market town just an hour away. Markle is not the first Black royal to live at the Castle. Prince Alemayehu Tewodros of Ethiopia stayed there about 150 years ago. We dawdled through the many rooms in the enormous castle. Some were filled with displays of guns and swords, china and silver, and many more with oil paintings by the Old Masters. I glanced at the stuff always trying to find the connection to Black history. It was there, but one had to have patience and know what to look for. We passed a hallway lined with china cabinets. I like looking at pretty things, but even for me the china was a bit much. That was until I saw the Rockingham porcelain dinner service, used at Queen’s Victoria coronation banquet in 1837. Each piece overflowed with intricate, but over-the-top decorations. The ornamentation showcased the bounty of the British Empire. Thus a bowl was balanced on a pineapple and another supported by twisted stalks of cane. Sugar cane. A sweet delight for the queen but days of endless pain for the slaves. Prince Alemayehu was a pawn in the British Empire. His father, Emperor Tewodros II of Ethiopia, had wanted an alliance with Britain to prop up his own rule. When the British ignored his request, he seized some of their traders and missionaries locking them up as hostages. It was an old tactic used by many rulers. Britain invaded Ethiopia to solve the diplomatic crisis. Rather than be captured, Tewodros followed another ancient tactic used by many defeated rulers. He took his own life. The British army in Ethiopia was made up of white officers, Indian troops and war elephants. Mission accomplished, the army packed up and sailed back to India. The spoils of war went to Britain, along with the archeologists and collectors who came with the military. Others might call them looters and treasure hunters. Among the plunder were 300 Ethiopian manuscripts, some of the most ancient Christian documents in the world. They are still in the British Museum as part of the Magdala Treasures, 1868. Other Ethiopian riches were sold to the highest bidder and are scattered around the globe. These include a score of tabots, the most sacred objects in Ethiopian churches. Prince Alemayehu was a souvenir of the jolly good war. The orphaned child was dragged around by his English guardian on his army career in Britain, India and then back to Britain again. As a celebrity trophy Prince Alemayehu had to get used to the cameras. He sat for many portraits by royal photographers, and the first was taken in 1868. It shows a noble and handsome boy. But it is the sadness in Prince Alemayehu’s eyes that tugs at my heart. I wish I could reach through time to hug and hold him tight. The little guy was seven years old. 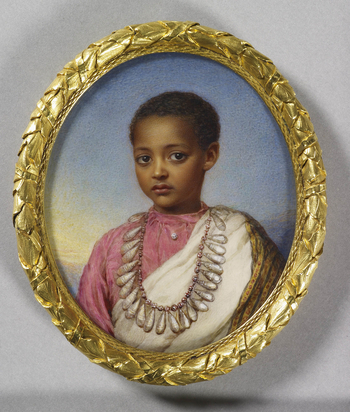 Queen Victoria mentioned Prince Alemayehu in her diary, always noting his sadness. She was his ward and saw him many times. I could find no photographs nor paintings of Prince Alemayehu on display inside Windsor Castle. The Prince was shifted around from boarding schools to Sandhurst Military College for officers. He never seemed able to settle. He looks like a lost soul in all his photographs. No amount of teas with the queen, fancy clothes or servants could fill his bruised heart. Many rooms in Windsor Castle overflowed with fine furniture made from expensive woods. A massive ebony cabinet stuck out for its sheer size and the blackness of the wood. As big as a wardrobe it was covered in intricate carvings. The black wood gleamed in the soft sunlight. Ebony furniture was and still is a status symbol. The tree grows in tropical countries such as Jamaica, Nigeria and India. The cabinet was a show-stopper when it was commissioned in the 1600s. Ebony was a sign of luxury and of the riches flowing from an empire. We passed through a cavern of a hall, with high ceilings and massive chandeliers. The audio-guide said it was a dining room for the Order of the Garter, an old boy’s club created by Edward III in 1348. Growing up in England, I vaguely recollected watching processions of the order on television. It was another excuse for superb pageantry by the royals and hangers-on. Dressed up in costumes from another era, the pageantry was one of those comforting rituals that conveyed the stability and endurance of British culture. Yes, right. My daughter gave me two minutes to walk through the hall. I thought her timing was generous till I remembered the Black history connection to the Order of the Garter. Haile Selassie, the Emperor of Ethiopia, became a member of the Order in 1954. He joins the other royals, emperors and knights in the select company. Being a member of the Order of the Garter is a symbolic way of cementing international alliances. Our next stop was St. George’s Chapel, where English kings and queens have prayed, married and buried for over 700 years. The outside was not very grand in my eyes but the interior made up for it. The soaring columns forced the eye upwards to admire the stain-glass windows. Dawdling and gawking among the crowd of tourists, the tombstones embedded in the floor caught my eye. I had forgotten that people could be buried inside a church. Of course they had to be rich or famous. I was shocked when I stepped on the grave of Henry VIII. His portrait was in the castle, the famous one of a fat and stern man, dressed in furs and dripping in jewels. No it was not the shoulder pads in the outfit that made Henry so plump. His suit of armour, also in the castle, confirmed his large girth. I wondered if Catalina de Cardones would have recognized him. This Black woman was the Lady in Waiting for Catherine of Aragon, the Spanish princess and first wife of Henry VIII. Unlike some of his other six wives, Catherine died with her head still attached to her body. I tried to find the plaque but ran out of time. The Chapel was getting ready for its daily evening service. My daughter spun away when I asked her if we should stay for it. Teenagers have no appreciation for rituals or history. Near the altar I briefly sat down to contemplate on the centuries of history around me. And the Black presence that runs through every one of those centuries. I said a prayer for Prince Alemayehu. He is gone but not forgotten.